Creating the perfect pound cake requires just a little attention to detail! This classic pound cake is buttery, rich, and moist. The simple flavor of butter and vanilla is an excellent canvas to pair with fresh berries or use this as your go-to base recipe for creating endless other flavors. Welcome to the first post in my new “Mastering” series. The purpose of this series is to tackle classic baking techniques and recipes and to gain a very in depth understanding of the subject. I’m immersing myself to the point where I feel I have mastered the skill enough that I could can teach it to someone else, aka you! I then pass the baton on to you and challenge you to master the skill and recipe for yourself! First up in the series is Mastering the Perfect Pound Cake! 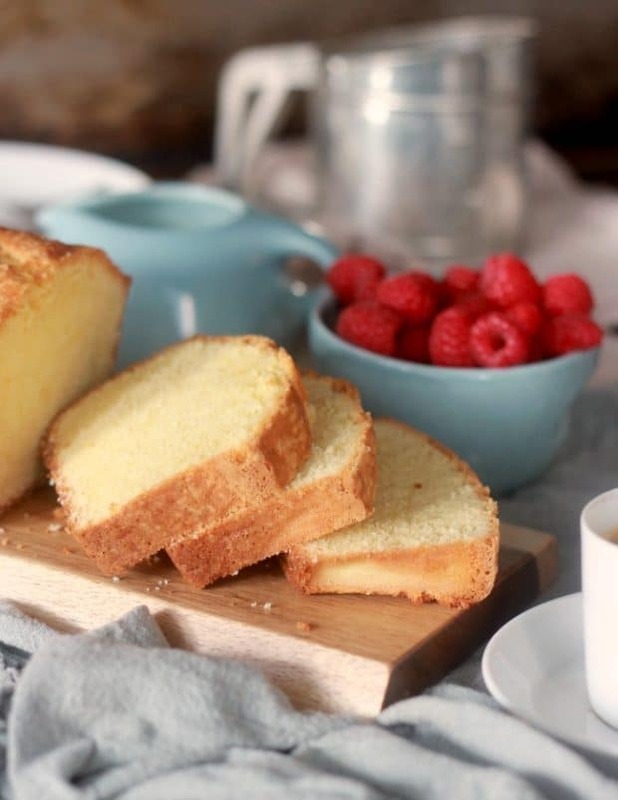 While classic pound cake can seem like quite a simple thing to bake, there is definitely quite a bit of nuance to making a truly perfect one. One of the things I love about pound cake is just how plain and simple it is. 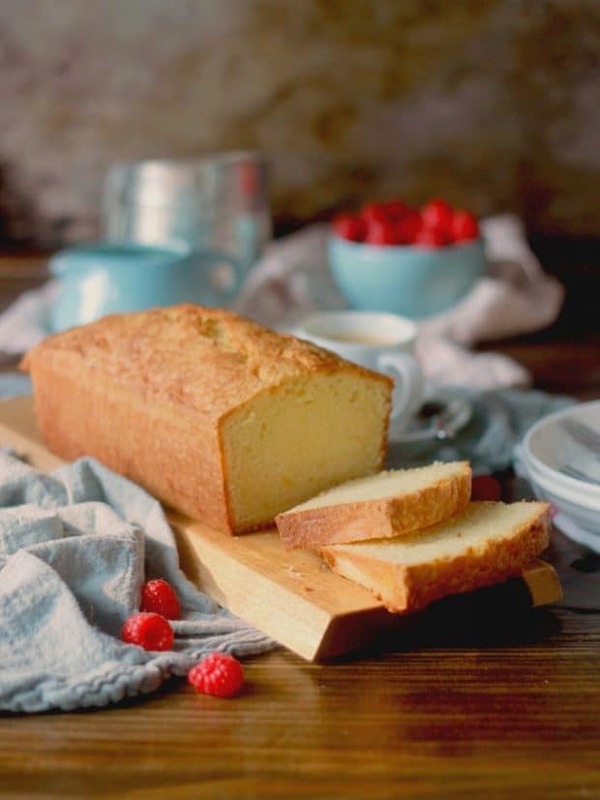 A good classic pound cake lends itself to being the perfect accompaniment to fresh fruit. But plain pound cake is also a blank canvas for you to paint with any flavor you like! The original recipe for pound cake called for 1 pound of sugar, 1 pound of butter, 1 pound of eggs, and 1 pound of flour. This is where pound cake got its name. Though, it would make sense to believe it is also because of the weight you might gain from eating it! The 1:1:1:1 ratio creates a very dense, rich, and somewhat dry cake that most of our modern palates do not prefer. It was intended to be a lasting cake that could hold up to sitting out for many days without spoiling. Many modern pound cakes deviate greatly from the true pound cake in order to meet our current expectations of a cake. You will find many recipes out there that are extremely different from what the original looked like. However, I want to stick close to the classic and perfect the true pound cake. You know what they say about learning the rules so you can break them? The goal is create a cake that highlights the richness and density of the original version while keeping it moist, flavorful, and not too heavy. To be completely honest with you, I am typically not the kind of baker that believes that using name brand ingredients is going to make a huge difference over a generic brand. But when you have a recipe with as few ingredients as pound cake, each one is significantly more important. Compare a generic store brand sugar to a name brand sugar, such as C&H or Domino, and you may notice that the sugar crystals are much smaller. The rise, also known as the leavening, of this cake is completely dependent on the ability of the sugar to hold a web of air with the butter (we’ll discuss in more detail later on). Therefore, a smaller sugar grain is significant because it can cause this web to break and the cake to fall. Did You Know: If the package of sugar does not specify “cane sugar,” chances are that it is actually beet sugar? Most generic store brand sugars are beet sugar. While those in the sugar industry claim beet sugar and cane sugar are chemically identical, many baking tests have proven that cane sugar creates much more superior baked goods! You may notice that this cake calls for cake flour instead of all purpose flour. Cake flour has a lower protein content than all purpose flour and helps to keep the cake tender. It really is the best flour to use in this tender cake. 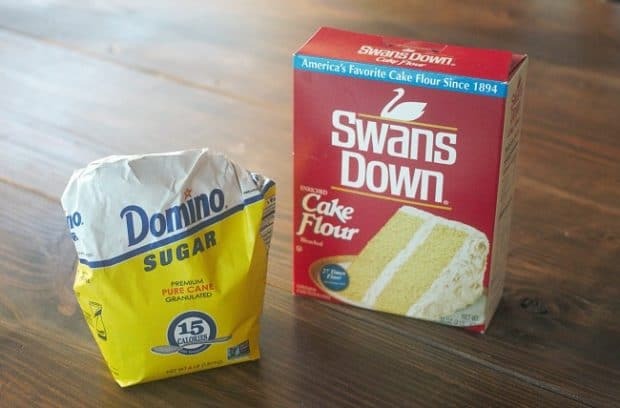 However, if you absolutely cannot find cake flour, you can substitute it with all-purpose flour mixed with corn starch (the amounts listed in the notes section of the recipe). If you make this substitution, sift the flour and cornstarch 3 times before adding it to the recipe. I know that seems excessive. But this truly helps the substitution to be more successful and more accurately mimic cake flour. It is extremely common for an oven to not be calibrated properly. Many ovens heat too low or too high compared to what the temperature is set at. This can vary greatly from oven to oven, therefore I highly recommend making the very small investment in buying an oven thermometer to test your own oven temperature. Pound cake, in particular, bakes at a fairly moderate temperature. An oven that is cooking to hot will cause the cake to set too quickly and prohibit the cake from rising. An oven that cooks too cool can cause the cake to fall because it won’t set quick enough. Mise en place, or the concept of “everything in its place,” is key to most any baking recipe. It is especially important with pound cake because you must pay special attention to the temperature of your ingredients. Read through the recipe fully, measure out all of your ingredients, and gather any equipment you might need before starting. I like to line my ingredients up in the order that they will be added into the recipe. This serves two purposes: It insures that you actually have all of your ingredients on hand before you start the recipe instead of getting halfway through only to realize you’re a little short on flour (ahem, been there! ), and it also helps to ensure you do not forget to add any ingredients into your batter. Baking Tip: If a recipe is written properly, the ingredients will be listed in the order that they will be needed. A simple classic pound cake does not utilize any chemical leavening (baking powder or baking soda). This cake relies solely on the air that is mixed into the batter during the creaming process for its rise. This process is known as physical leavening. 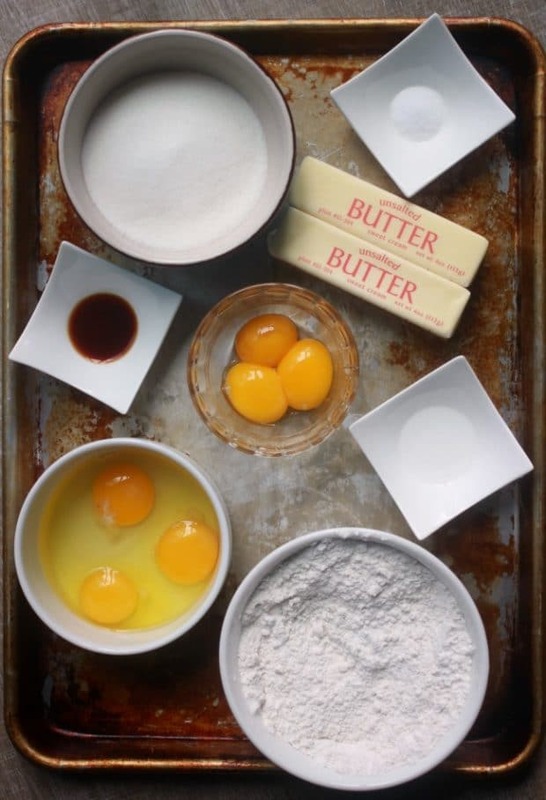 It is important that the butter and eggs are at room temperature, around 70 degrees F, before starting your recipe. The physical leavening process happens as the butter is beaten with the sugar, also known as creaming, and air is trapped in a web of sugar and fat. If the ingredients are too cold, the structure will remain weak causing the batter to break. 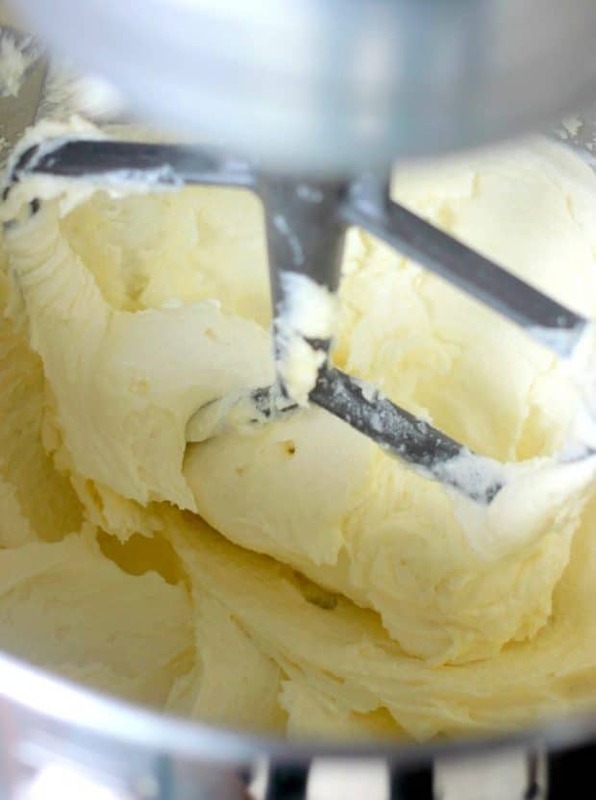 Baking Tip: Many kitchens are warmer than 70 degrees F. Make sure that your butter is soft but still solid when you go to make a recipe that calls for softened butter. If your butter is too warm and starting to melt it can greatly affect the results of your recipe. Creaming the butter and sugar together properly is absolutely a key skill in perfecting the pound cake. The technique is not difficult at all, it just requires some patience. 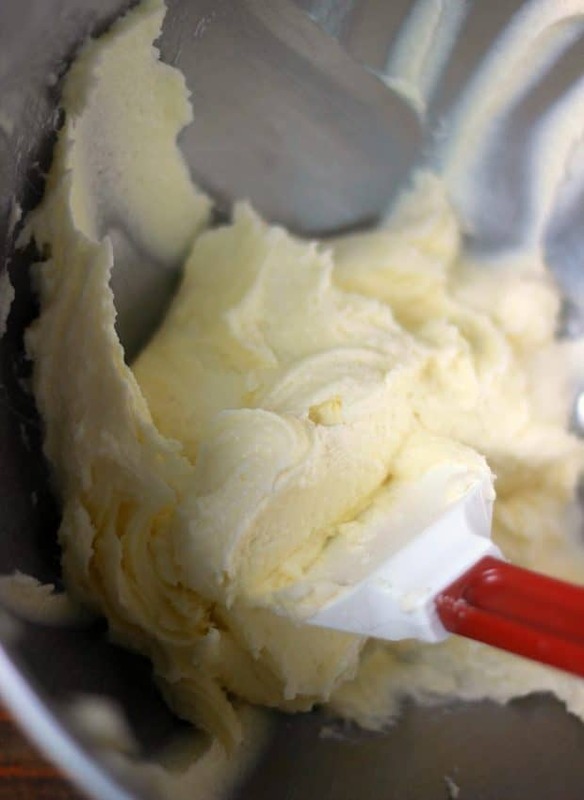 Start with your room temperature butter and beat it in your stand mixer on medium speed for about 2 minutes. With the mixer still running, gradually stream in your sugar. Continue to beat for 4-5 extra minutes until the mixture is very light in color and fluffy. The purpose of this process is to force air into the mixture that will leaven the cake. You do not want to rush it. The cake will get its rise from these air bubbles expanding in the oven as well as from the steam generated from the water evaporating off the cake as it cooks. Now that your have forced air into the butter and sugar, it is time to add the eggs. The way in which the eggs are added is equally important. Original pound cakes used only whole eggs, while this recipe uses both whole eggs and egg yolks. The additional egg yolks serve to help to create an emulsion which will stabilize the trapped air. If additional whole eggs were added, instead of just egg yolks, more air would be beaten into the cake and it would would result in a product that is too airy than what a pound cake should be. In order to create this emulsion, the eggs must be added very slowly. I keep the mixer running on medium speed and add the eggs in 1 TBSP at a time. The process of incorporating the eggs should take about 5 minutes in total. Rushing this process will cause the emulsion to break and curdle and you will have a dense cake on your hands. Emulsion: An emulsion is a mixture of two liquids that are normally unmixable. In this case, butter is already an emulsion because water is suspended in fat when it is created. Because eggs have a high percentage of water content, another emulsion is created when they are incorporated into the fat/sugar mixture. I know, I know. The instruction of “do not over-mix” is in so many recipes, but what does it truly mean? This instruction is especially important when you are working with delicate baked goods, as well as baked goods that are being leavened with air. Pound cake falls into both of these categories. Once the flour is added into the batter, you want to gently fold it in. As soon as it is incorporated throughout, stop mixing. When flour is hydrated, gluten formation begins. The more the batter is worked, the more the gluten structure will develop. You want to limit this as much as possible to keep your cake very tender. You also do not want to deflate the air that you worked so hard to beat into your butter! Many baking recipes state that when the tester inserted into the middle of the cake comes out clean, then the cake is done. However, this instruction actually leads to an over-baked cake. You want to pull the cake out of the oven when the tester comes out with a moist crumb. The residual heat in the cake will continue the cooking some even after it is out of the oven. If you wait to pull the cake until it is completely dry in the middle, you will have a very dry pound cake. Once your cake is done baking and you have pulled it from the oven, remove it from the pan and place it on a baking rack to cool completely. If the cake is left in the loaf pan to cool, the heat will be trapped in the pan and it will steam the cake around the edges resulting in an undesirable texture. Quickly moving the cooked cake from the pan to the cooling rack will also ensure your cake does not continue cooking for too long, resulting in a cake that is too well done. Baking Tip: Line your loaf pan with parchment paper so that you can easily pull the cake out of the pan once it is done baking. ^ Watch the video to how to easily line a loaf pan! There you have it! 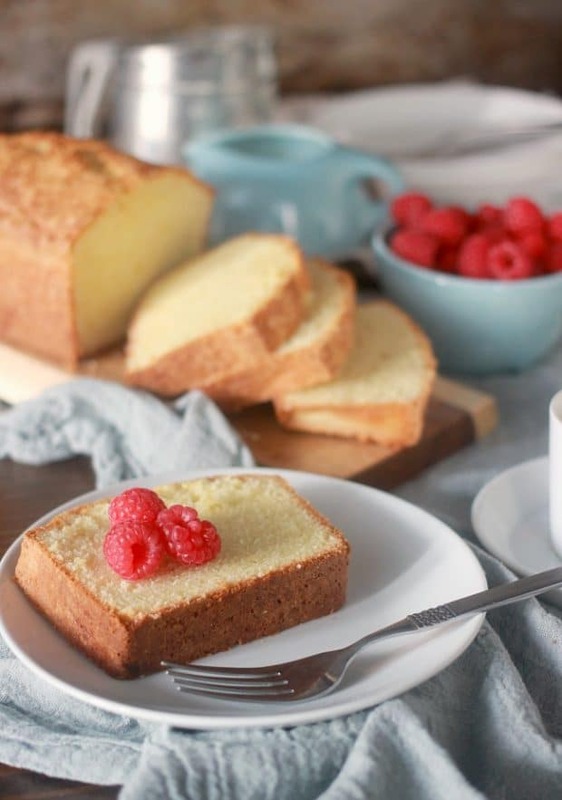 A beautiful, simple, and perfect pound cake! Do you think you can master it? I KNOW you can! Won’t you join me? I’m passing off the baton to you to master the pound cake and I want to see how you did! Share your beautiful pound cake results with me on Instagram with the hashtag #bakerbettie. I can’t wait to see! Preheat your oven to 350 degrees F (175 degrees C). Grease an 8 x 4 inch (20 x 10 cm) loaf pan with pan spray or by rubbing it with butter, and line it with parchment paper. Set aside. In the bowl of a stand mixer fit with the paddle attachment, beat the room temperature butter on medium speed for about 2 minutes. With the mixer still running, slowly stream in the sugar. Continue beating for 5 additional minutes. Stop the mixer and scrape down the sides of the bowl halfway through. The mixture should be very pale yellow, almost white, and light and fluffy after mixing. While the butter and sugar are creaming together, combine the whole eggs, egg yolks, vanilla, and water together in a small bowl. Lightly whisk together just until combined. With the mixer still running on medium speed, add the eggs in very gradually. Add about 1 TBSP at a time until they are all incorporated. This whole process should take about 5 minutes total. You do not want to rush it as it will cause your emulsion to break. Stop the mixer and use a rubber spatula to fold in the flour. As soon as the flour is incorporated, stop mixing. Over-mixing can cause the glutens to develop too much and can also cause the air that was beaten into the butter and sugar to begin deflating. 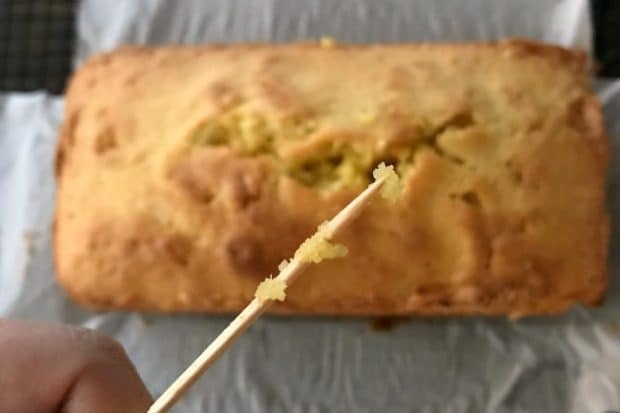 Pour your batter into your prepared loaf pan and bake at 350 degrees F (175 degrees C) for 50 - 60 minutes, until a wooden skewer inserted into the middle of the cake comes out with moist crumb. Immediately remove the cake from the pan and place on a cooling rack to cool completely. Once completely cooled the cake can be wrapped in plastic wrap and stored at room temperature for up to 1 week. This recipe can be doubled to be baked in a bundt pan. This was a really good and fun tutorial. Thanks so much for putting the time in to share with us, and for the little tips I didn’t know. Just had a tooth pulled so I won’t be making this in the next few days, but once I’m feeling better . . . mmmmmmm. I think it would be perfect with my berries I have stashed away in the freezer. I look forward to your next tutorial! Hi Julie! I hope you are starting to feel better! Having a tooth pulled is not fun! I can’t wait to hear if you try and it and how it is with your berries! Always loved to bake pound cakes but needed your tips for perfection. Mother used to bake pound cakes in tube pans and got crunchy tops. Everyone raved about her cakes. They were awesome. Loved your post. Hi John! What a lovely memory of your mother! Do you know if she sugared her tube pan to get her cake to have a crunchy top? It sounds lovely! If you do want to make this in a tube pan make sure you double the recipe! Can this recipe be used in a tube pan or bundt pan? This recipe would need to be doubled if you want to use a tube or a bundt pan. I haven’t specifically tested it that way, but I would assume it would need a longer baking time. Let me know if you try it and how it turns out! Any suggestions for mini loaves time/temp? Hi Erinn, I have not tested this with mini loaf pans. I would guess 350 F for about 20-25 minutes. But definitely watch them and test them to see where they are at in the process! Great question! Self-raising flour is a completely different animal. I’m actually working on a post about that coming up on Thursday! Self-raising flour is plain flour that has baking powder and salt mixed throughout it, while cake flour is a lower protein flour that has been more finely ground. If you cannot find cake flour or pastry flour (which is very similar and would be a good substitute), you can use make a cake flour substitute with plain flour (all-purpose flour) and cornstarch. The cup for cup ratio for this substitution is 1 cup all-purpose flour minus two tablespoons and replace that with 2 tablespoons of corn starch. After you measure it, sift it 5 times. I know that sounds insane, but it is necessary to be a close substitute. So for this recipe you would want to measure out 1 1/2 cups + 1/2 tablespoon of plain flour & 3 1/2 tablespoons of corn starch and sift those together! I will add a note in the recipe about making this substitution! I made this yesterday for family. Topped if with fresh strawberries and whipped cream. It was a big hit! Your detailed directions were wonderful and the reason for my accomplishment of the perfect pound cake. Hi Janet! That makes me so happy to hear! I love that you took the challenge and perfected it. Amazing job! I made this pound cake for my mother’s birthday yesterday and let me tell you…… It was ABSOLUTELY AMAZING and everybody LOVED it so much that there was NOTHING left! We ALL had 2 pieces….. Thank you for posting this recipe and explaining the difference of genetic sugar and the all purpose flour! Go buy “cake flour, & Dominion sugar” like she says. Thanks again and I’ll be baking another one REAL SOON . This is a great tutorial! Very detailed and organized. I really appreciate the work put into this. Would I be able to use two cake pans with this recipe? Hi there! This recipe is not enough to fill two cake pans. To make 2- 9″ round cakes, you will need to double this recipe. I live in Prescott, Arizona. The elevation here is 4,700 feet. Would you be able to tell me the adjustments I need to make to the above recipe? Hi Dori! Unfortunately, I do not have any experience with high altitude baking. But according to my culinary school book these are the adjustments I would suggest: Decrease the sugar to 1 cup + 2 TBSP (224 gr), increase the water to 2 1/2 TBSP, and increase the oven temperature to 375 F. I hope that helps! I am completely amazed how absolutely gorgeous this pound cake looks, tastes perfect just perfect. I don’t say this lightly. We had a wonderful catering Co. and appreciate good easy wonderful foods. Thank you so much for how you explained the steps a d tips are great. Made this for my sweet husband 50th bday! Complete Success! He said His grandmother would be proud- huge compliment! WHOOHOO! Would you please double the recipe for me. Mine is just a little different. Hi John, just seeing this comment as I was taking some time with family over the holidays. You never want to measure your flour after sifting it unless a recipe specifically calls for it which it rarely does. Sifted flour will be much more volume than pre-sifted flour. So you want to measure your flour and then sift it. Hope that helps! what if i wanted to add citrus juice to this recipe? do i take out a yolk or two to make up for the liquid? thank you! Hi Mary! 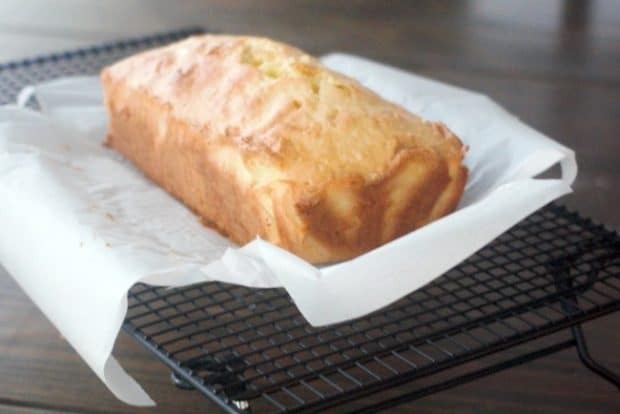 If you want to make this a citrus pound cake my best recommendation would be to use zest in the cake and then use the citrus juice to make a simple glaze to pour over the top. I would suggest zesting 1 large or 2 small lemons and add that into the butter/sugar mixture when creaming it. The fat will really carry the flavor through the cake. You can then make a simple powdered sugar glaze like this one with the lemon juice. Can u double a pound cake recipe? You absolutely can! Let me know it goes! Hi, Can this be bake in a vintage glass bread pan? The pan size is 10×5, Thank you for sharing. Hi Evy! Unfortunately, glass pans are not ideal for cakes. The way the heat is conducted makes the cake brown a lot on the outside while not getting enough heat to the inside. If you do want to try it, I recommend turning the heat down by 25 F and watching the cake closely. But for best results, a light grey metal pan is best. I’ve made it twice and twice the center has collapsed, what am I doing wrong? The taste and texture are great. Hi Ronald, so strange. Are you testing the center? I have a feeling it might not be baked all the way through when you pull it. Try increasing your bake time by 3-5 minutes. It’s also possible that your oven is not heating properly. Do you by chance have an oven thermometer to check if your oven temperature is heating to what you have it set at? One other thought, are you by chance at high altitude? Thank you for the quick reply. I’m not at high altitude. But you maybe right about my oven not heating correctly. I’ll try cooking it 3-5 minutes longer. Once again than you for your quick reply. You’re welcome! I hope it helps!